I like orange-y reds, so I decided to try Die Another Day from the Skyfall Collection, which leans a bit orange. It has a slightly brownish/orangish red base, with an incredible heavy shimmer that is pure, dramatic red. I couldn’t capture in pictures how crazily flashy and bright the red shimmer looks; in the sun it’s intense. The formula on this polish is nice and it only took two coats to be opaque. Even though the shimmer is really heavy, it dries down with no brushstrokes. In the shade you can see how nice and smooth it dries, with no brushstrokes. 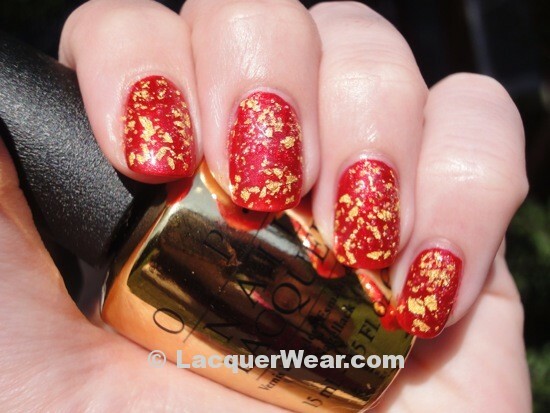 I used Die Another Day as a base for the fancy topcoat from the Skyfall Collection, The Man With The Golden Gun. It says that it’s full of actual 18k gold flakes. I don’t know enough about the cost of 18k gold needed for these little flakes to know whether it’s reasonable that the flakes are truly made from gold. But that’s what it says. I found the clear base to be a bit goopy and hard to work with, and I ended up using about two and a half coats of it to get the look below. I think it would be better with just two thinner coats, so that the flakes are spread out a little bit more. In person this combination was really bright and exotic-looking; it reminded me of Chinese dragon puppets and brocade. The red shimmer still comes through in between the gold flakes. I think that the gold might look even nicer over a more contrasting color, like a green or purple. I’m planning that for next time, but I could imagine this being a fun Christmas manicure. I ordered my The Man With The Golden Gun from an etailer since I didn’t want to have to keep re-visiting my Ulta, with a small baby in tow. The last time I was at Ulta it was nowhere to be found, as I suspected would be the case. It should start showing up sometime? 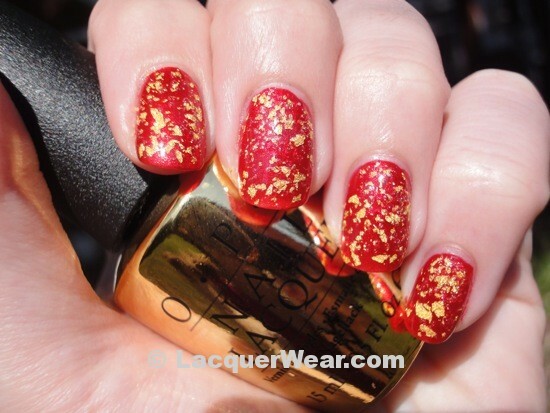 I bet it’ll take awhile for supply to catch up with demand, though, kind of like the OPI shatter polishes.